Our projects range from very little work to complete rebuilds. 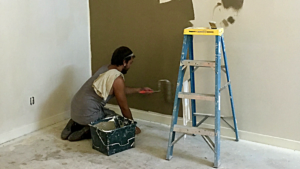 Painting is our most common renovation. Although Hermit Haus Redevelopment, LLC is a relatively new company (founded in 2015), this isn’t our first redevelopment rodeo. Our leadership team has decades of experience buying sad houses and making them happy again. If you’re thinking about doing business with us in any capacity, we thought you’d like to see some of our work. On the following pages, you’ll see how we focus on quality. Our mentors have a saying, “People first, profits second.” We truly believe that if we provide a valuable service to sellers, reliability to our investors, and a quality redeveloped home to our buyers, the profits will fall into place. To protect the privacy of our buyers, we list only the code name of each project. On the Market—projects currently available or under contract (given the 88 forms of turbulence, they might still be available. Current projects—houses we are currently working on. They’s not on the market yet. Completed Projects—houses we have completed and sold or leased. Lessons Learned—projects that did not work out.